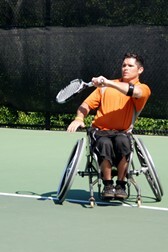 The 31st Texas Open Wheelchair Championships were held May 12 – 15 in Carrollton Texas, a suburb of the Dallas Metroplex. The week got off to a stormy start on Wednesday when what felt like a "hundred year storm" brought a lot of rain. While the rain was unwanted on match days, it did bring cool temperatures and mild breezes that made for great playing conditions. While the excellent playing conditions were not the norm, The Dallas Wheelchair Tennis Club delivered on the promise that everything is always bigger in Texas. Dedicated volunteers and staff of the Oak Creek Tennis Center provided Texas size hospitality, service, and excellent food. The BIG tennis was left up to the players and they delivered as well. In the Men’s Open division, Steve Welch made quick work of the top half of the draw. He dropped only one set to Australian, Adam Kellerman. On the bottom half of the draw, number two seed, Joel Dembe, had set himself up to capture his second singles title of the year. Welch used the hometown crowd to take the first set 6-0. Dembe did not want to go out without a fight in the second set. Welch was able to get the break of serve needed to successfully retain the title. Welch and partner Hunter Groce of San Antonio upended both the number two and number one seeds to win the men’s Open Doubles title. The Quad Open draw utilized a round robin format to decide a champion. Greg Hasterok of San Diego California earned his second Texas Open singles title by going undefeated in the round robin. Marc McLean surprised the draw by taking second place when he defeated the higher ranked David Jordan in a nail biting three setter that started off with a first set tiebreaker. The USTA Letter Divisions were well represented and chock-full of hotly contested matches. Anthony Meadows of Tulsa Oklahoma defeated Jody Lawhead of Mart Texas to win the Men’s A Singles title. Meadows then partnered with Larry Salyer, also of Tulsa to defeat hometown favorites and number one seeds, Carlos Turic and Rick Cooper for the doubles title. The Men’s B Singles final saw Larry Salyer capture the title against Scott Robertson of St. Paul Texas. The B Doubles title went to number one seeds, Scott Robertson and Jake May of Dallas Texas when they defeated Adam Lucio of Odessa Texas and Chris Parnell of Lincoln Nebraska. In Men’s C, newcomer Malcolm Wright, Culver City California, had to utilize a Super Tiebreak against David Hartsek of Lexington Kentucky to clinch the singles title. In the C Doubles finals match David Hartsek partnered with Michael Delgado of Mesquite Texas to defeat Pat Mulvihill of Biloxi Mississippi and Glen Singletary of Baker Louisiana. USA Junior World Team Cup member, Kate Stuteville of Colleyville Texas went undefeated in the round robin Women’s A division. Beth Redford of Grand Rapids Michigan took second place. Shari Ahlberg of Carrollton Texas partnered with singles winner Kate Stuteville to defeat Krystal Kelley and Beth Redford, both of grand Rapids Michigan. Senior Doubles titles were won by Rick Cooper and Jody Lawhead in the Open/A division while David Hartsek and Chris Parnell took the B/C division. In addition to all the tennis, the Dallas Wheelchair Tennis Club presented long time member and former TOWC tournament director, Don Drewry with the Randy Snow Spirit of the Sport Award. The award was created in 2008 in partnership with Randy to honor those individuals or groups that have embodied the spirit, passion, and selfless dedication to grow and develop not only wheelchair tennis as a sport but the players as well. Previous recipients include Bill Hammett, Ron Williams, and Bruce Karr. Nominations are accepted annually in February. Nomination forms can be obtained from DWTC.org.